Disclaimer: I have yet to see Disney's Frozen, so I have no idea about how extensive Elsa's criminal activities go. I'm assuming they are pretty pervasive, given how much I've heard it talked about by numerous children I've found myself around. Just days after police in Harlan, Kentucky issued a warrant for her arrest, Queen Elsa was located this morning all the way in Hanahan: a small town near Charleston, South Carolina. Hanahan police spotted Elsa freezing a fountain in broad daylight. Police swooped in and arrested the Snow Queen before she could bring down the fury of a cold front threatening the area. 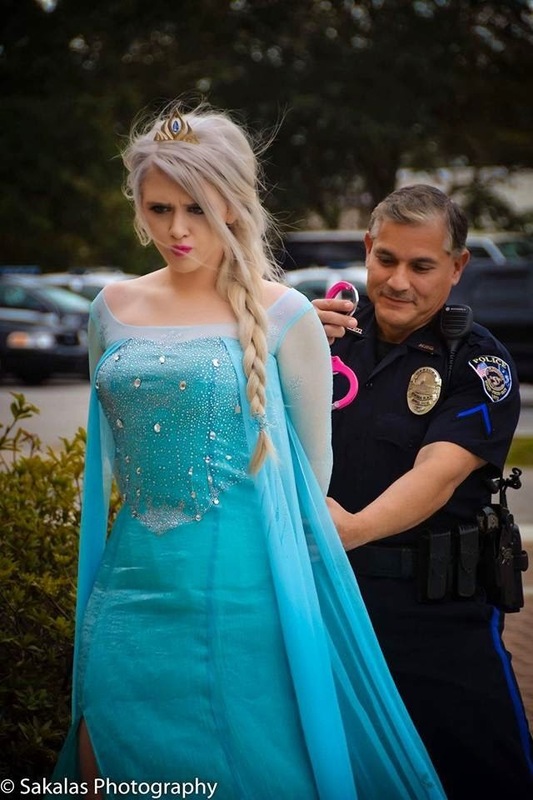 With more bitter cold heading to the Lowcountry this week, Hanahan police officers tried to do their part to stop the encroaching weather by arresting the Snow Queen. Police Chief Mike Cochran and Officer Flor Reyes made the arrest. In this case, police could not let her go after spotting her freezing a fountain in Hanahan. However, she was freed after a bond court hearing. Apparently the ice melted before the hearing, taking with it any evidence. The ABC News 4 link has much more about Elsa's arrest, including several other photos among them pics of her getting her bond hearing. No word on whether Elsa began singing "Let Me Go" after being handcuffed.